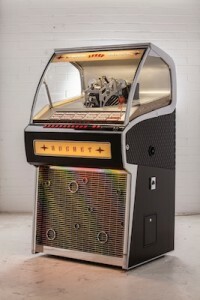 The only manufacturer in the world now producing vinyl jukeboxes. Designed by UK manufacturer Sound Leisure, a new vinyl jukebox has been designed for the first time in nearly two decades. The prototype is the latest product in Sound Leisure’s Rocket series. “We are officially now the only jukebox manufacturer in the world to now be producing a vinyl jukebox,” Sound Leisure’s Chris Black toldInterGame. The biggest challenge involved creating the jukebox’s changer mechanism. “This has been a project of epic proportions and we are extremely excited about the new 140-selection player mechanism,” Black added. Oddly enough, the prototype model makes its debut at the Classic Car show at ExCeL in London, which runs this weekend from 18-21 February.